The SBS AEMS (Acoustical Emission Monitoring System) allows our customers to monitor their grinding process with exceptional precision. Also known as gap and crash control or gap/crash, the AEMS product uses proprietary acoustic technology to monitor the very high frequency signals generated on the grinding machine structure during key events in the grinding process. The user can set up the system easily and quickly, and immediately reap the benefits of improved control over the grinding process. The benefits to the user include elimination of the grinding gap time in the grind cycle, notification and prevention of machine crash conditions and automatic quality monitoring of wheel dressing. The gap time in a CNC controller grinding cycle represents the time required for slow grinding wheel in-feed prior to making contact with the work-piece. The position of the work-piece with respect to the grinding wheel can only be known within the tolerances of the part and process. Rapid wheel in-feed must therefore be stopped prior to where the part contact is expected and the wheel very slowly moved in toward the work-piece until contact is achieved. This can add significantly to the time required to grind each part, reducing production efficiency. Gap elimination can be provided by the system wheel used in conjunction with the machine’s CNC control. The AEMS system allows rapid and automatic grinding wheel in-feed right up to the point of initial contact with a new part loaded in the machine. The system can automatically detect the initial contact and very quickly report this event to the machine control, which then stops the wheel in-feed without operator intervention required. Part crash can occur when a part or fixture is incorrectly loaded into a grinding machine, or some abnormal condition occurs. Rapid in-feed of the wheel may result in a dangerous or expensive crash. The AEMS system allows the CNC control to monitor the acoustic levels on the machine and detect any unexpected contact when it happens. The system can report that extreme contact has begun within 1 millisecond providing an output to the CNC to stop the grinding wheel in-feeding. Positional control is also possible with the AEMS system. A grinding wheel has a constantly changing diameter as it wears or is dressed. The AEMS system can detect the edge of the wheel touching a reference point that’s position is already known to the machine CNC. This means the CNC can effectively measure the diameter and exact position of the grinding wheel, effectively zeroing the machine before beginning a grinding or dressing cycle. 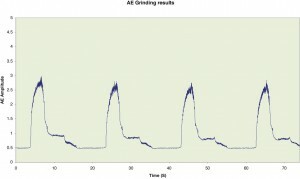 Using the AEMS system to monitor the dressing process is also possible. The system allows the user to set up minimum and maximum acoustic levels expected during normal wheel dressing. The operator or CNC control can then determine not only if the wheel is being dressed all the way across its width, but can control the aggressiveness of the dressing process and control the resulting quality of the dressed wheel. This can be very useful when using expensive Super-abrasive or CBN grinding wheels where material removal during dressing needs to be minimised. The AEMS card can be added to any SBS balancer controller at any time and provides 2 sensor input sockets. These 2 inputs can be used for any grinding or dressing monitoring combination. With the 4 channel SBS controller, up to 4 AEMS cards can be used at any one time giving a user up to 8 inputs from 8 different AE sensors. Acoustic sensors are easy to retrofit and very resistant to grinding machine coolants and grinding paste. The reaction speed of the AEMS system is much quicker than traditional methods of spindle load or current monitoring. The Schmitt AEMS sensors come in a variety of formats such as telescopic in-spindle, external, mini and fluid types.